The Ranger Fund was recently announced winner of the 2018 FundSource Awards – Alternative Sector. This category included Australian and New Zealand long-short funds. We set the Ranger Fund up as a place for our personal savings. We see it as our core savings fund. However, we acknowledge that the award speaks to the defensive characteristics of the fund, and our different approach to investing. Here are four reasons for considering it as a valuable compliment to a core Australasian equity portfolio. The fund does not have to be invested in equities if we see no opportunities. This is useful when markets are expensive. The fund currently holds in excess of 30% cash and equivalents. We can use derivatives to protect the downside. We are currently targeting a 1% investment in put options. This is effectively an insurance policy. If markets are benign this investment will result in roughly a -0.75% per annum headwind, which is effectively the insurance premium. If there is a major market meltdown this portfolio could deliver up to 20% total portfolio return. We take a long-term, absolute return perspective when investing in companies. We are not looking to beat an index or a comparable company when we invest, we are looking to find a company that we expect will be worth a lot more in the future irrespective of markets. The chart shows some of our put option research and trading. 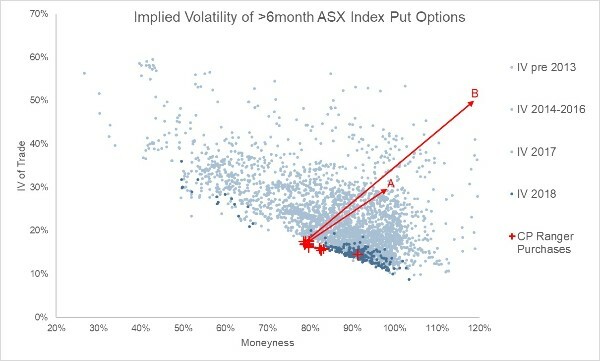 The blue dots represent 50-lot put option transactions on the ASX from 2013 to June 2018. The darker the dot the nearer the transaction to today. Note that there is a trend to transacting at lower volatility prices. This indicates that until late 2018, the market has been relatively benign and put option prices are reasonable. The red crosses show our transactions in the same period, and the arrows indicate what we would expect the prices to move to in the event of different scenarios. Scenario A represents a moderate bear market where equity prices fall 30% and implied market volatility increases to 30%. Scenario B represents a market meltdown where prices drop 50% and implied volatility rises to 50%. The matrix overleaf shows the common holdings between the Ranger Fund, some New Zealand equity funds, and the New Zealand index. The Ranger Fund has virtually no common holdings. 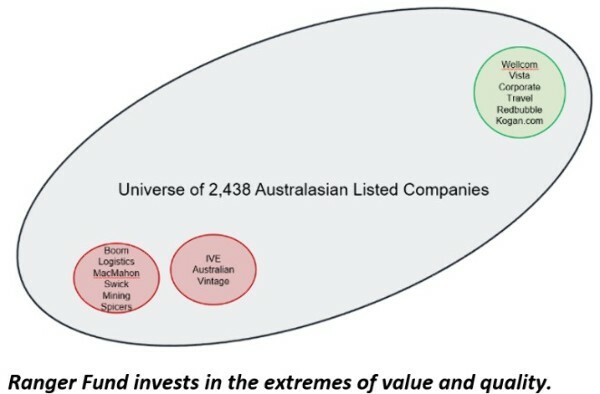 Including the Ranger Fund should result in lower volatility of your overall Australasian equity portfolio. Some of these companies do not have public research attributed to them. In the short-term the prices of these investments can be quite volatile, making it difficult to directly own them. However, in the long run, in our opinion, you are handsomely rewarded for owning these companies. Using the Ranger Fund as a compliment to your core equity portfolio gives you access to these wonderful long-term investments which otherwise might not be attainable. The Ranger Fund is currently 5-star rated by Morning Star and is ranked number one on three- and five-year performance in the Aon investment manager survey (see here). The equity team managing Ranger Fund also manage the Trans-Tasman Fund which is currently ranked number one on all periods in the Aon survey in its category. The track record of the Trans-Tasman strategy goes back to when the team was at Tower, managing $400 million in the strategy. At the time of leaving Tower, this strategy was also ranked number one. This gives the team a nearly 10-year track record of top quartile, if not top performance over most periods. get access to an expert equity team that can invest where you can’t.